A Logan Square shop owner who'd been robbed in the past grabbed a baseball bat and fought back when a pair of men came in intent on robbing the place. Store surveillance cameras captured the bold brawl at Quizhpe's Gifts & Sports, in the 2200 block of North Western Avenue, at about 5:30 p.m. Tuesday. The robbers, one of them with a gun, apparently had no idea what they were in for when they walked into the shop. "One of the guys, he said, 'Give me the money or you are dead,' and after that I was close to him and I tried to hit him with the bat, and the other guy he started shooting," said Luis Aucaquizhpi. Aucaquizhpi's brother-in-law, 62-year-old Luis Quizphe, fended off the gunman with a baseball bat for a moment before the shooter tried to run away. Little did the robber know, however, that customers need to be buzzed in and out of the store. Seeing that they couldn't get out, one of the attackers returned to the counter and continued shooting. 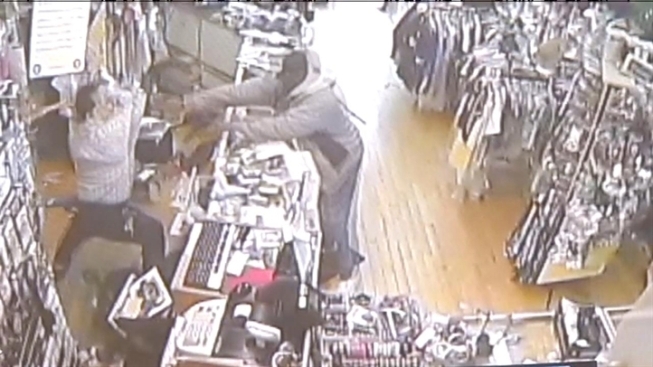 Aucaquizhpi is seen in the video tossing a stool at the gunman and later chasing him with a fire extinguisher after the two robbers buzzed themselves out of the shop. Quizphe was shot in the leg during the ordeal and was listed in good condition at Advocate Illinois Masonic Hospital on Wednesday evening. The man with the gun appears to also have shot his accomplice. Police said they found 10 shell casings on the floor. Quizphe's son credited God for being on his dad's side. "I thank God that nothing worse happened to him, that he's alive. I'm grateful for that," said Juan Quizphe. Police said no arrests had been made in the case as of Wednesday afternoon. After getting away, the men, whom Aucaquizhpi described only as being black men, ran north on Western Avenue and then west on Belden Avenue before getting into a gray car.